Sometimes inspiration doesn’t come from those who “have made it” really big with bank account balances reading like phone numbers (if making lots of money can be counted as success at all). Inspiration might not come from those who have climbed up the ladder of their careers, probably through not very straight methods. Real inspiration might, however, come from the groceries woman who, in spite of having gone to bed at 11.00 pm, wakes up at 2.00 am in the morning, takes a bus to the city market to pick her merchandise and by 5.00 am she is back in the house. Instead of going back to bed for a couple of hours, she starts preparing her children for school. By the time they leave for school, it is time to open her grocery where she has to stay the whole day selling her vegetables. The cycle repeats itself daily. Never mind that what she makes in a month is barely enough to feed her family, pay rent, school fees and other expenses. Think of the “matatu” driver who takes the “mama mboga” to the market at those wee hours of the night! The poor guy probably went to bed past midnight after ferrying the last bunch of passengers home. This means he is deprived of sleep, but the idea of his family going to bed on an empty stomach scares the sleep out of him! He must work the whole day, however tough and dangerous it is to drive under a sleep-deprived condition. Think of the relentless spirit of the hawker who has to hawk his/her wares under the scorching sun and sometimes this person has to talk to about 20 prospective buyers without selling even a single item, but he/she doesn’t give up because luck might smile on him/her on the 21st person that he/she will approach. Think of the small-scale farmers upcountry who rise up very early in the morning and withstand the stinging cold dew of the morning in their small tea farms, as they pluck the leaves. After this, they have to spend the rest of the day at the tea-buying centres so as to weigh their products. Apart from the unscrupulous clerks weighing their products inaccurately hence stealing directly from them, their tea has to go through so many middlemen and brokers, who get the lion share from the export sales. The poor farmer only earns peanuts from his/her product at the end of the month. Meet the cart pusher who earns a livelihood by ferrying other people’s luggage. 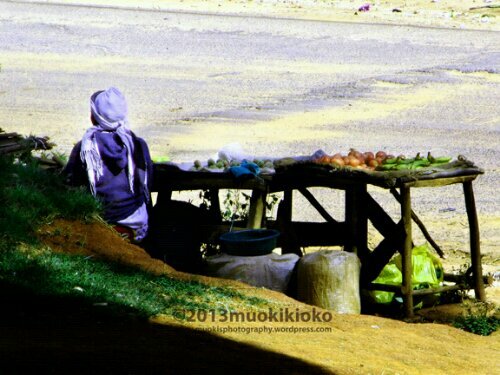 By the time the “mama mboga” arrives in the market, he is already there ready to assist her transport her merchandise to the bus station at a fee. One wonders when this fellow catches even a wink of sleep! Just wake up one early morning and have a look at the migration of humanity, on foot, towards the industrial area from Eastlands, Kibera and Kawangware. All these people go to perform lowly paying menial jobs in the industries. Remember, not all of them get a chance to be taken in.Some have to walk back home after curtly being told, “we are sorry, there is no job for you today.” But even so, they will still rise very early and come to try their luck the following day. all these people do whatever it takes to earn an honest living and put food on the table, for themselves and their families. These and many more hardworking Kenyans in various fields, doing jobs that don’t seem prestigious at all, are the people who really inspire me. they are the workhorses that keep the engine of our economy roaring. They don’t sit around waiting for alms. They do their best to ensure that their families don’t go to bed on empty stomachs. All of them are driven by the same thing: HOPE for a better tomorrow. Hope that things will improve someday and that their government will somehow lessen their burdens by reducing taxes on consumable goods, especially foodstuffs hence making them more affordable to all. What inspires most is that these people are not cowed by their hard situations since they can still afford a warm smile and say “we are fine” when you greet them.These are my mashujaas. My hat is off in respect for them anytime. Beautiful! A very thought provoking post! I agree wholeheartedly! #Reblogging! Thanks for taking your time to read the post. I join you bro in celebrating these true heroes and heroines. They give meaning to life every day. I thank God for each one of them. Reblogged this on BIRD'S EYE VIEW. Quite inspiring material for Kenyans to understand, more particularly the leadership.